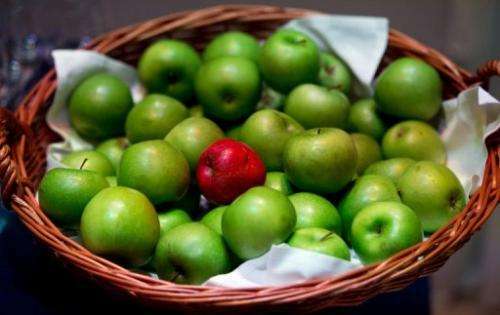 A red apple lies among green ones at the World Economic Forum in Davos, in January. Global warming is causing apples to lose some of their crunch but is also making them sweeter, a study said Thursday. Global warming is causing apples to lose some of their crunch but is also making them sweeter, a study said Thursday. Previous studies had shown that global warming was causing apple trees to flower earlier, and that harvests were also affected by changes in rainfall and air temperature. The farms are located in Japan's Nagano and Aomori prefectures, which had seen a mean air temperature rise of 0.31 and 0.34 degrees Celsius (0.5 and 0.6 degrees Fahrenheit), respectively, per decade. The orchards were chosen because there had been no changes in cultivars or management practices for extended periods, thus ruling out non-climate factors like technological improvements in the apple change. The data collected over the years included measures of acid and sugar concentration, fruit firmness and watercore—a disease that causes water-soaked areas in the flesh of an apple. Oh nose!!! Sweeter apple juice.